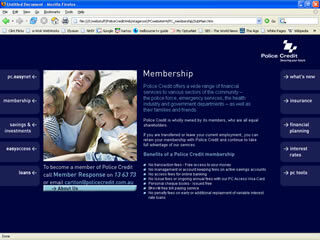 Police Association Credit Co-operative first engaged Media Empire to build their Intranet site. Subsequently they've been employed to build two complete overhauls of the credit society's web site, working with different graphic design teams to create unique, distinctive, professional designs. 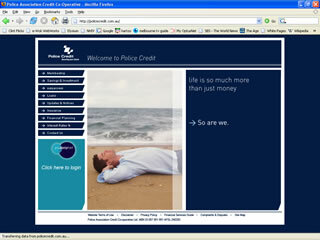 Police Credit required a Multimedia company that was flexible and reliable to build their web site, as the nature of the project was slightly different to the norm. Warwick was recommended to me by another multimedia production facility who assured me that Warwick would be flexible enough to complete our new website with a stop and go approach. We needed to use this approach due to the complexity of internal security management. We are completely satisfied with the outcome of this project. Warwick managed to deliver all of the requirements in a timely manner while adapting existing SQL database and content management systems into the new build as an additional task. It should also be noted that Warwick fully grasped the concept that he could not have Enterprise Management over our SQL database and could only run a specialised scripting tool to manipulate the existing database system. In addition to the website Warwick also built our Intranet site with multiple secure areas. Using templates and Cascading style sheets, we were able to give a lot more users content management rights which we did not have in our old intranet site. Since the creation of the intranet site we have been able to expand it on a number of occasions. The most recent being the addition of a user maintained Events Calender, Anniversary and Trading Post section which Warwick built in a very short amount of time. We have used Warwick on a number of projects since the web site build and will continue to use his services as he always delivers on time and on budget.